The circadian clock controls a wide variety of metabolic and homeostatic processes in a number of tissues, including the kidney. However, the role of the renal circadian clocks remains largely unknown. To address this question, we performed a combined functional, transcriptomic, and metabolomic analysis in mice with inducible conditional knockout (cKO) of BMAL1, which is critically involved in the circadian clock system, in renal tubular cells (Bmal1lox/lox/Pax8-rtTA/LC1 mice). Induction of cKO in adult mice did not produce obvious abnormalities in renal sodium, potassium, or water handling. Deep sequencing of the renal transcriptome revealed significant changes in the expression of genes related to metabolic pathways and organic anion transport in cKO mice compared with control littermates. 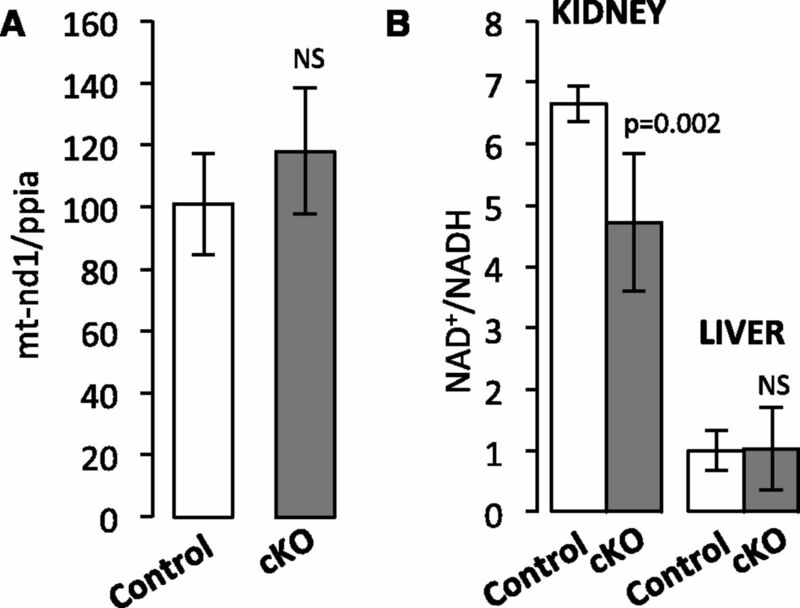 Furthermore, kidneys from cKO mice exhibited a significant decrease in the NAD+-to-NADH ratio, which reflects the oxidative phosphorylation-to-glycolysis ratio and/or the status of mitochondrial function. Metabolome profiling showed significant changes in plasma levels of amino acids, biogenic amines, acylcarnitines, and lipids. In-depth analysis of two selected pathways revealed a significant increase in plasma urea level correlating with increased renal Arginase II activity, hyperargininemia, and increased kidney arginine content as well as a significant increase in plasma creatinine concentration and a reduced capacity of the kidney to secrete anionic drugs (furosemide) paralleled by an approximate 80% decrease in the expression level of organic anion transporter 3 (SLC22a8). Collectively, these results indicate that the renal circadian clocks control a variety of metabolic/homeostatic processes at the intrarenal and systemic levels and are involved in drug disposition. The circadian timing system is an essential physiologic regulatory mechanism that provides cells, tissues, organs, and finally, the whole organism with an important functional advantage of anticipation of circadian changes in the environment that are imposed by the Earth’s rotation. The circadian timing system is organized in a hierarchical manner, in that the central oscillator located in the suprachiasmatic nucleus of hypothalamus coordinates subsidiary oscillators located in peripheral tissues. On the molecular level, both the central and peripheral oscillators share a common molecular clock mechanism on the basis of cell–autonomous and self–sustained transcriptional/translational feedback loops. This core clock mechanism controls circadian expression of so–called output genes that, in turn, impose cell–specific functional rhythms (reviewed in refs. 1 and 2). Previous studies have shown that the circadian timing system plays a major role in renal function. In mice, whole-body inactivation of different elements of the molecular clock leads to abnormal circadian patterns of urinary sodium and potassium excretion, loss of the circadian rhythmicity of plasma aldosterone levels, and significant changes in arterial BP (reviewed in refs. 3–5). In humans, growing evidence suggests a possible link between dysregulation of renal circadian rhythms and development of hypertension and accelerated progression of CKD. The importance of the circadian clock system in the kidney has been recently shown on the molecular level. Zuber et al.6 and Nikolaeva et al.7 have shown that hundreds of transcripts in the microdissected distal convoluted tubule/connecting tubule and the cortical collecting duct exhibit significant circadian oscillations in their expression levels and that the whole-body inactivation of circadian transcriptional factor Clock leads to dramatic changes in the transcriptomes of the distal convoluted tubule/connecting tubule and the cortical collecting duct. Gumz and colleagues8–10 have shown that the circadian clock protein PER1 exerts diverse effects on the renal handling of sodium. Zhang et al.11 have shown that, among 12 tested mouse tissues, the kidney exhibits the second greatest number of circadian transcripts (the greatest number was found in the liver). However, the role of the renal circadian clocks in the generation of functional and molecular rhythms in the kidney as well as the development of kidney disease remains largely unknown. To our knowledge, the only study that addressed this question is a recent paper by Tokonami et al.,12 which showed that ablation of the circadian clock in renin–secreting granular cells results in several abnormalities, including increased GFR, decreased plasma aldosterone levels, and low BP. Here, we studied the role of circadian clocks in the nephron by using conditional and inducible inactivation of BMAL1 protein, an indispensable element of the molecular clock (Bmal1lox/lox/Pax8-rtTA/LC1 mice). The renal tubular cells are involved in a wide variety of essential functions, including maintenance of homeostasis, disposition of xenobiotics, and synthesis of molecules that are released into the bloodstream (e.g., bicarbonate and arginine). Because many of these processes exhibit circadian rhythmicity, the aim of this study was to identify the molecular pathways/mechanisms that are directly controlled in the nephron by the tubular circadian clock. Using an approach combining functional, metabolomics, and deep sequencing analyses, we show that the tubular circadian clock is not a prerequisite for the control of the GFR or the water, sodium, and potassium balance. However, we show that the tubular circadian clock is deeply involved in the control of both intrarenal and systemic metabolisms as well as drug disposition. The conditional inactivation of the Arntl gene encoding BMAL1 was induced by 2-week treatment with doxycycline (DOX; 2 mg/ml in drinking water) of 8-week-old Bmal1lox/lox/Pax8-rtTA/LC1 mice (hereafter referred to as conditional knockout [cKO] mice). In parallel, the same DOX treatment was provided to their littermate controls (Bmal1lox/lox mice; hereafter referred to as control mice). The quantitative PCR (qPCR) analysis revealed that Bmal1 mRNA expression was significantly reduced in the kidneys of cKO mice (2 months after the end of DOX treatment) (Supplemental Figure 1). Immunohistochemical staining for BMAL1 and CRE expression was performed on day 5 of the 2-week DOX treatment period or 2 months after the end of DOX treatment. As shown in Supplemental Figure 2, at day 5 of DOX treatment, the CRE was ubiquitously expressed along the renal tubule but not in glomeruli or blood vessels in cKO mice. The BMAL1 protein was ubiquitously expressed in all kidney cells in control mice, but in cKO mice, all tubular cells became negative for BMAL1 staining at day 5 of DOX treatment (Supplemental Figure 3). The specific tubular inactivation of BMAL1 was maintained in cKO mice 2 months after the end of DOX treatment (Supplemental Figure 3). To assess the effect of BMAL1 deficiency on circadian mechanisms per se, we performed qPCR analysis of expression levels of several genes involved in the core clock (Cry1, Per2, and Nr1d1) and Dbp, an output gene that is directly controlled by the circadian clock. As shown in Supplemental Figure 1, the BMAL1 deficiency results in a significant attenuation in circadian oscillations of mRNA expression of Cry1, Per2, Nr1d1, and Dbp. The expression level of Bmal2, a paralog of Bmal1 that is thought to be able to rescue the BMAL1 deficiency in some tissues,13 was increased in kidneys of cKO mice, but the absolute levels of Bmal2 expression remained significantly lower than those of other tested core clock components (Supplemental Figure 1). Collectively, these results suggested that the activity of the circadian clock in renal tubular cells is significantly impaired. PAX8 is a paired–box transcriptional factor crucial to the organogenesis and development of the kidney, the thyroid gland, and the Müllerian system. Traykova-Brauch et al.14 used a partial Pax8 promoter to target the expression of a tetracycline-dependent transactivator to the renal tubular cells. The tissue specificity of the promoter-driven expression was assessed in the kidney, liver, heart, lung, brain, spleen, thyroid, and colon. Among the tissues tested, the Pax8–driven CRE expression was found all along the renal tubule and in a subset of periportal hepatocytes. Hence, we tested the BMAL1 expression in the liver. As shown in Supplemental Figure 4, indeed, some proportion of liver cells located in the vicinity of large blood vessels appeared negative for BMAL staining in DOX–treated cKO mice. To avoid the potential side effects related to DOX toxicity, all additional analyses were performed 2 months after the end of DOX treatment. For all experiments, mice were adapted to a 12-hour light/12-hour dark cycle for 2 weeks. The cKO mice were overtly normal; their body weight was not different from the control mice, but their kidney weight-to-body weight ratio was significantly decreased (Table 1). The basic morphologic analysis did not reveal any obvious renal abnormalities in cKO mice (tested parameters: gross renal morphology, interstitial fibrosis, glomerular sclerosis, inflammation, and vascular lesions; data not shown). Blood collection was performed at Zeitgeber time 4 (ZT4) and ZT16 (ZT0 is the time of lights on, and ZT12 is the time of lights off); 24-hour or hourly urine was collected from freely moving mice housed in metabolic cages with free access to food and water. As shown in Table 1, the only difference found in 24-hour urine samples was a significant reduction in urinary pH in cKO mice. Because the whole-body knockout of Clock results in significantly different circadian kinetics of urinary water, sodium, and potassium excretion, we also analyzed the hourly urine excretion pattern in control and cKO mice. To exclude the influence of light on urine excretory rhythms, the hourly urine collection was also performed on animals placed in constant darkness 30 hours before urine collection (dark/dark conditions). As shown in Supplemental Figures 5 and 6, the circadian patterns of urinary excretion of water, sodium, and potassium were not different between control and cKO mice in both light/dark and dark/dark conditions, respectively. Basic analysis of plasma samples revealed significant increases in creatinine (ZT4 and ZT16), urea (ZT4 and ZT16), and magnesium (ZT16) levels as well as osmolality (ZT16) in cKO mice (Table 1) (t test). Differences between ZT4 and ZT16 for plasma parameters were analyzed by two-way ANOVA. As shown is Supplemental Table 1, ANOVA revealed a significant effect of time on plasma osmolality and plasma concentration of sodium, potassium, calcium, creatinine, urea, and aldosterone. This effect of time was similar between control and cKO mice. Importantly, there was no difference in the GFR between control and cKO mice as measured by inulin clearance (Table 1). The cKO mice showed a modest but statistically significant decrease in systolic BP (false discovery rate <0.001) but not in diastolic BP; the inactive–phase BP dipping was not different between control and cKO mice (Supplemental Figure 7, Supplemental Table 2). The 24-hour activity, heart rate, and pulse pressure were not different between genotypes (data not shown). The increased plasma creatinine and urea levels along with normal GFR suggested a tubular impairment in cKO mice. Because the circadian clock has been shown to control a variety of physiologic processes, we performed unbiased kidney transcriptome and plasma metabolome analyses in control and cKO mice to identify metabolic/homeostatic pathways and/or transporter systems that are controlled by the renal circadian clock. Transcriptome profiling of RNAs extracted from the whole kidney (ZT4 and ZT16) was performed by deep sequencing, and the partial metabolome profiling (180 plasma metabolites from five substance classes; i.e., hexose, amino acids, biogenic amines, acylcarnitines, and lipids; BIOCRATES Life Sciences AG, Innsbruck, Austria) was performed on plasma samples collected at ZT4 and ZT16. For each sample, from 34 to 50 million sequencing reads were aligned to the mouse genome (Supplemental Table 3). As shown in Figure 1A, 721 and 765 transcripts exhibited differential expression levels between control and cKO mice at ZT4 and ZT16, respectively (false discovery rate <0.05) (Supplemental Table 4). Among them, 552 transcripts were commonly changed at ZT4 and ZT16 (Figure 1A, Supplemental Table 4). Gene ontology analysis with these 552 genes followed by summarization in REVIGO15 revealed enrichment of processes related to cellular metabolism (carboxylic acid metabolism cluster shown in the blue box in Figure 1B, Supplemental Table 5) and organic anion transport (organic anion transport cluster shown in the pink box in Figure 1B, Supplemental Table 6). Differential expression of six selected genes, namely nicotinamide phosphoribosyltransferase, peroxisome proliferator–activated receptor-δ, mitochondrially encoded reduced nicotinamide adenine dinucleotide (NADH) dehydrogenase 1, carnitine transporter Slc22a5, monocarboxylate transporter 1 (or Slc16a1), and cyclin–dependent kinase inhibitor 1a (or p21), was validated by qPCR (Supplemental Figure 8). Analysis of transcripts encoding proteins located in mitochondria showed that transcripts encoded by both mitochondrial and nuclear genomes are significantly over-represented among the most downregulated genes in cKO mice at both ZT4 and ZT16 (P<0.001; two–tailed Mann–Whitney U test) (Supplemental Figure 9). Because the circadian clock has been shown to control mitochondrial biogenesis,16 we performed a quantitative analysis of mitochondrial genomic DNA in kidneys of control and cKO mice. As shown in Figure 2A, the mitochondrial DNA content was not different between control and cKO mice. The NAD+-to-NADH ratio, a marker reflecting the oxidative phosphorylation-to-glycolysis ratio, was significantly decreased in the kidney of cKO mice but not in the liver (Figure 2B). Analysis of genes differentially expressed in kidneys of Control and cKO mice revealed enrichment of processes related to the cellular metabolism and organic anion transport. (A) Heat maps of normalized expression values of genes significantly affected in kidneys of cKO mice at ZT4, ZT16, or both time points (false discovery rate <5%). Expression values were mean centered, variance normalized, and subjected to hierarchical clustering (complete linkage) using Pearson correlation as the similarity metric. 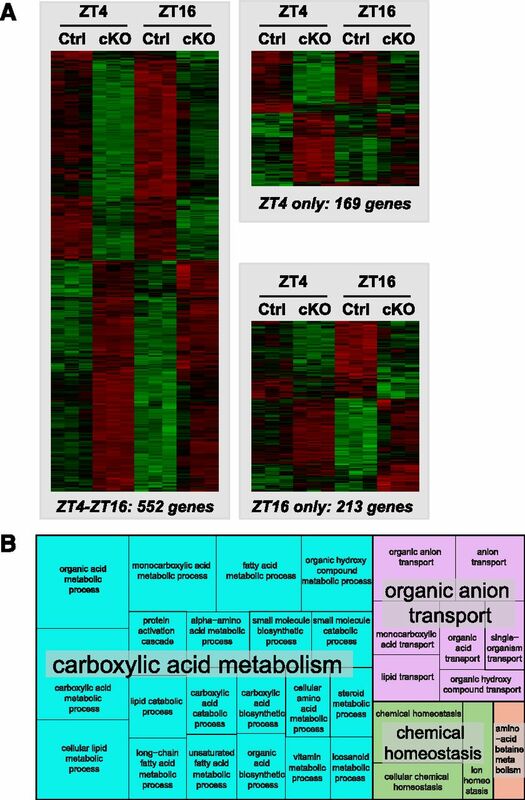 (B) Gene ontology analysis showing significantly enriched biologic processes (Bonferroni correction) among 552 genes differentially expressed in kidneys of control and cKO mice at ZT4 and ZT16. Significant biologic processes were summarized and classified with REVIGO. Ctrl, control. Altered renal metabolism in cKO mice. (A) Quantification of mitochondrial DNA (mtDNA) in kidneys of control and cKO mice (ZT8). Relative amounts of mtDNA and nuclear DNA were quantitated by qPCR of mitochondrially encoded NADH dehydrogenase 1 (mt-Nd1) and nuclear Ppia (cyclophilin) genes16 (mean±SD; n=6; t test). (B) NAD+-to-NADH ratios in the kidney (ZT12) and the liver (ZT12) of control and cKO mice (mean±SD; n=6; t test). Metabolome analysis revealed significant differences in the plasma levels of amino acids (arginine [ZT16], glutamate [ZT4], and methionine [ZT 16]), biogenic amines (asymmetric dimethylarginine [ZT16] and creatinine [ZT4 and ZT16]; thereby confirming results of blood chemistry analysis) (Table 1), carnosine (ZT16), taurine (ZT16), carnitine (ZT4 and ZT16), and several acylcarnitines of different species of phosphatidylcholine, lysophosphatidylcholine, and sphingomyeline (Supplemental Table 6). Comparison of metabolome and transcriptome data allowed us to identify several potential mechanisms through which tubular circadian clocks participate in the control of blood metabolome. Mechanisms involved in the control of plasma urea/arginine and creatinine levels were selected for validation and more in–depth analysis. Urea is the end product of ammonia detoxification in the liver, a process that depends on the activity of Arginase I, an enzyme that converts l-arginine formed in the liver urea cycle into urea and l-ornithine. The kidney expresses the second arginase isoform, namely ARGII, but its activity is significantly lower than the activity of Arginase I in the liver. Hence, it is generally accepted that, in the normal physiologic state, Arginase II (ARGII) does not influence plasma urea levels.17 Most of the circulating l-arginine is synthesized in the kidney proximal tubule from l-citrulline that is absorbed from the small intestine. Analysis of transcriptomes revealed that ARGII transcript levels are significantly upregulated in kidneys of cKO mice (Supplemental Figure 10A, Supplemental Table 5). Western blotting performed on microdissected renal tubules (Figure 3A, Supplemental Figure 10B) and immunohistochemical staining (Supplemental Figure 10C) showed that ARGII protein expression is dramatically increased specifically in the proximal straight tubule. As shown in Figure 3B, the enzymatic arginase activity was significantly increased in kidneys of cKO mice and reached approximately 25% of arginase activity in the liver; the liver arginase activity was not different between control and cKO mice. In parallel, arginine levels in kidney tissue of cKO mice were significantly increased (Figure 3C), thereby providing a potential link with hyperargininemia in the cKO mice shown in the metabolomic profiling (Supplemental Table 6). Interestingly, the activity of the nitric oxide synthase, the second major arginine–consuming enzyme in the kidney,18 was also significantly increased in cKO mice (Figure 3D). Altered arginine production/degradation in cKO mice. (A) Western blot analysis of ARGII protein expression in the proximal straight tubules (PSTs) microdissected from kidneys of control and cKO mice (ZT8). Three mice per genotype were used for this analysis. (B) Arginase activity in the kidney (ZT0) and the liver (ZT0) of control and cKO mice (mean±SD; n=3; t test). (C) l-arginine (L-Arg) levels in kidney tissue of control and cKO mice (ZT8; mean±SD; n=6; t test). (D) nitric oxide synthase–specific l-citrulline (L-Citr) formation in kidney tissue of control and cKO mice (ZT8; mean±SD; n=6; t test). prot, Protein. Creatinine, a weak organic acid, is eliminated in the urine by glomerular filtration and in part, tubular secretion. 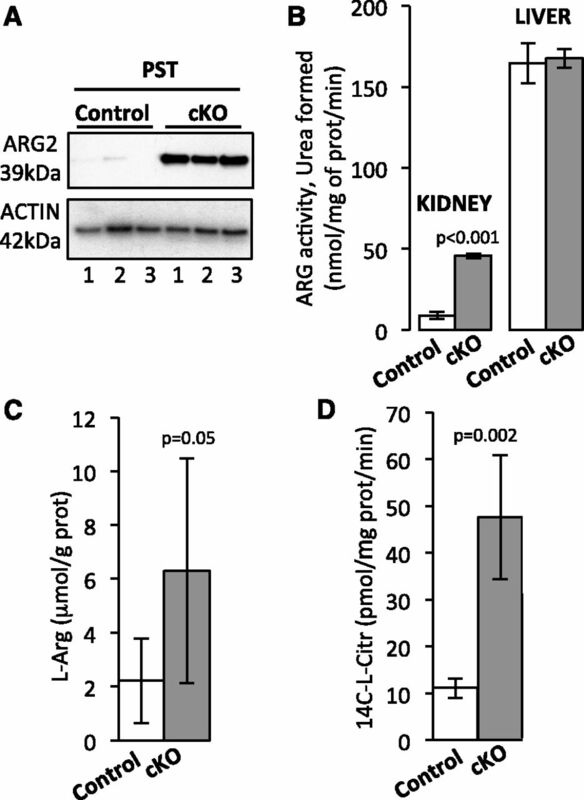 Vallon et al.19 have shown that organic anion transporter 3 (OAT3 [Slc22a8]) significantly contributes to the creatinine secretion in the mouse kidney. Analysis of transcriptome revealed that OAT3 expression is reduced in cKO mice at both ZT4 and ZT16 (Supplemental Table 4). These results were confirmed by qPCR (Figure 4A). Western blotting showed an approximately 80% reduction in OAT3 protein expression in cKO mice (Figure 4B) (P=0.004). Because OAT3 is involved in the basolateral transport of a variety of organic acids, including several clinically important drugs, we tested the possibility that the tubular circadian clocks control pharmacologic properties of furosemide, a diuretic that is actively secreted in the kidney by OAT3. As shown in Figure 4C, the cKO mice exhibited rightward shift in the natriuretic dose-response curve for furosemide (control mice: half maximal inhibitory concentration (IC50)=0.117±0.048 μg furosemide per 1 g body wt; cKO mice: half maximal inhibitory concentration (IC50)=0.263±0.094 μg furosemide per 1 g body wt; mean±SD; n=5; P=0.01; t test). In parallel, cKO mice showed lower urinary furosemide excretion after a single 0.3-μg/g body wt furosemide bolus (Figure 4D). Lower OAT3 mRNA and protein expression correlates with impaired natriuretic response to furosemide and decreased urinary excretion of furosemide in cKO mice. (A) qPCR analysis of Oat3 (Slc22a8) mRNA expression in kidneys of control (white circles) and cKO (gray circles) mice (mean±SD; n=6). (B) Western blotting with anti-OAT3 or anti-glyceraldehyde 3-phosphate dehydrogenase antibodies on protein extracts prepared from kidneys of control and cKO mice (n=5 mice in each group) at ZT16. (C) Rightward shift in the natriuretic response to furosemide in cKO mice (mean±SD; n=5). The half maximal inhibitory concentration (IC50) values were calculated using the GraphPad PRISM 6 software (GraphPad Software, La Jolla, CA) at ZT16. (D) Lower urinary excretion of furosemide in cKO mice. Furosemide was dosed in the urine collected for 10 minutes followed by the 0.3-μg/g body wt furosemide bolus (mean±SEM; n=8; t test). Body wt, body weight; Ctrl, control; iv, intravenous; UNaV, sodium excretion rate; v, vehicle. An intriguing result of this study is that the renal phenotype of cKO mice differs significantly from that of Clock null mice.7 The major differences are in the normal circadian dynamics of urinary water, sodium, and potassium excretion, the normal plasma aldosterone levels, and the normal GFR in cKO mice, whereas these functions were significantly impaired in Clock null mice. This difference suggests that either the tubular circadian clocks are not involved in the generation of urinary excretory rhythms or the inactivation of tubular circadian clocks could be fully compensated for by other mechanisms. These findings raise the question about the tissue/cellular origin of renal excretory rhythms. Okamura and colleagues20 showed that mice lacking Cry1 and Cry2 exhibit hyperaldosteronism and blunted circadian oscillations in plasma aldosterone levels caused by increased aldosterone synthesis in adrenal glands. We have recently shown that the deletion of Arntl in renal granular cells results in modified circadian rhythm of urinary sodium excretion, polyuria, increased GFR, and low BP.12 Accumulating evidence from the work by Titze et al.21 suggests that total body sodium content fluctuates independently of intake or body weight, thereby pointing to a possible role of extracellular sodium storage/release dynamics. Also, there is strong evidence that the circadian rhythms of urinary potassium excretion are determined, at least in part, by the net potassium fluxes between intracellular and extracellular compartments.22 Collectively, these results suggest that circadian clocks in many different organs/cell types may participate in the generation/maintenance of circadian rhythms of urinary sodium, potassium, and water excretion, but the role of the intrinsic renal tubular clocks in these processes remains unclear. However, we found that the tubular circadian clock is deeply involved in several other essential physiologic functions, including control of both the intrarenal and systemic metabolisms, elimination of xenobiotics/drugs, and maintenance of homeostasis of compounds secreted into the blood by the kidney (nota bene, it remains possible that some of the observed changes result from circadian clock–independent activity of BMAL1). The critical role of the circadian clock system in the control of metabolism has been shown in a number of tissues23; however, the novelty of our study is that the suppression of the tubular circadian clock greatly affects the plasma metabolome in a way that, in turn, may affect metabolic and homeostatic processes at the systemic level. Our partial metabolome analysis covered <5% of the total plasma metabolome estimates (180 versus approximately 4000 metabolites, respectively), but even this restricted approach allowed us to identify >50 metabolites that are differentially represented in plasma of cKO mice. Comparison of transcriptome and metabolome data allows us to establish tubular mechanisms that are disturbed in cKO mice. For instance, carnitine deficiency in cKO mice correlates with significantly decreased expression of the Scl22a5 carnitine transporter involved in the carnitine reabsorption in the proximal tubule. Of note, the loss of function of Slc22a5 is a well known cause of primary carnitine deficiency.24 Two of these mechanisms, namely those that are involved in the renal control of plasma creatinine and urea levels, were selected for in-depth analysis. These two mechanisms were chosen, because (1) plasma creatinine and urea concentrations are commonly used as surrogate biomarkers of glomerular (dys)function in clinical settings and (2) creatinine secretion in the kidney occurs through the same transporter systems as those used by many clinically important drugs (see below). We found that the increase in plasma urea levels correlates with tubular dysfunction and does not correlate with glomerular dysfunction. We show that cKO mice exhibit a parallel increase in the renal ARGII activity and renal and plasma arginine levels. Arginine, a semiessential amino acid, is synthesized in the proximal convoluted tubule and released into the bloodstream, where it can be, in part, recovered by the proximal straight tubule and converted to urea and l-ornithine by ARGII or oxidized to nitric oxide and l-citrulline by nitric oxide synthases in tubular and nontubular renal cells.18 Interestingly, the activity of the nitric oxide synthase was also significantly upregulated in kidneys of cKO mice. Collectively, these results suggest that the circadian clock in tubular cells controls both the intrarenal arginine metabolism and systemic arginine and urea levels. Similarly, we found that the increase in plasma creatinine levels has tubular origin and results from the decreased expression levels of OAT3. This finding has a second important facet that supports the link between the circadian clock and the pharmacokinetics of drugs. The OAT3 transporter is involved in tubular secretion of a variety of clinically important drugs, including diuretics (furosemide and bendroflumethiazide), antiherpetics (acyclovir), antiretrovirals (tenofovir), antineoplastics (methotrexate), antibiotics (benzylpenicillin), and many others (reviewed in ref. 25). Here, we show that the reduced expression of OAT3 in cKO mice correlates with a less potent natriuretic effect and a lower rate of urinary elimination of furosemide, a diuretic that is not filtered in glomeruli and must be secreted into tubular lumen to inhibit the sodium-potassium-chloride cotransporter 2. To our knowledge, this is the first demonstration that the renal circadian clocks are involved in drug pharmacokinetic. Hence, together with the well documented effects of the circadian clock on drug metabolism in the liver,26 drug absorption in the intestine,27 and drug distribution,28 our study shows that the circadian timing system interferes with drug pharmacokinetics at very different levels and highlights the attention that must be given to chronopharmacology and chronotherapy. The procedures used to generate the characterization of Bmal1lox/lox, Pax8-rtTA, and LC-1 Cre mice were described previously.14 The three mouse lines used in this study are inbred strains bred on the genetic background of the C57BL/6J mouse. The animals were maintained ad libitum on the standard laboratory chow diet (KLIBA NAFAG Diet 3800). Before all experiments, mice were adapted to a 12-hour light/dark cycle. All experiments with animals were performed in accordance with the Swiss Guidelines for Animal Care, which conform to the National Institutes of Health Animal Care Guidelines. Partial plasma metabolome profiling (180 plasma metabolites from five substance classes; i.e., hexose, amino acids, biogenic amines, acylcarnitines, and lipids) was performed by BIOCRATES Life Sciences AG. Plasma aldosterone levels were measured by radioimmunoassay (DPC). The NAD+ and NADH levels in kidney and liver tissues were determined by the PicoProbe Colometric Kit from BioVision, Inc. (San Francisco, CA). Kidney tissue spermine levels were determined by Ansynth Service B.V. Kidney tissue l-arginine levels were determined by a kit from MyBioSource. Arginase activity in the kidney and liver tissues was determined as arginase–specific urea formation from 14C-l-arginine as previously described.29,30 NOS activity was determined as nitric oxide synthase–specific l-citrulline formation from 14C-l-arginine as described in Supplemental Material. The BP was measured in conscious unrestrained mice using telemetry (DSI System). Gene analysis was by RNA sequencing (Supplemental Material). This work was supported by Swiss National Science Foundation Research Grant 31003A-149440 (to D.F.). Selected data in this manuscript were previously presented at the November 11–16, 2014 (Philadelphia, PA) and November 3–8, 2015 (San Diego, CA) Annual Meetings of the American Society of Nephrology. S.N., C.A., G.C., and S.P. contributed equally to this work. This article contains supplemental material online at http://jasn.asnjournals.org/lookup/suppl/doi:10.1681/ASN.2015091055/-/DCSupplemental.